The success of an organization is built off of the trust of customers, employees and the general public. 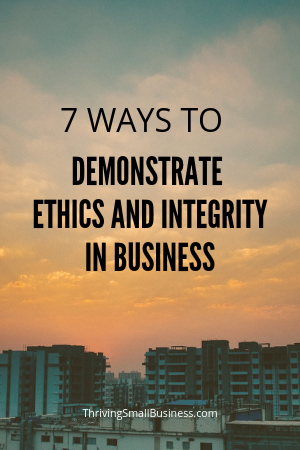 The best way to gain that trust is to demonstrate ethics and integrity in business practices. Not because of legal requirements – but because it is the right thing to do. A great example is the infamous Enron Collapse and Bernie Madoff Ponzi scheme stories. Thousands of employees and investors were impacted. Which resulted in corporate collapse due to unethical behaviors and business practices. The integrity of a business affects all customer groups and every area of business operations. Which is why it is important to incorporate ethics and integrity into the core fabric of the organization. Ethical standards in business are built off of a customer focus and commitment to providing value to its customers. When an organization is committed to improving the lives of its customers, it would be when there is a violation of that trust that would cause concern from a strategic perspective. For instance, the Facebook privacy and data sharing scandal, caused mistrust of users. There was deception and users did not have a good understanding of how Facebook was using their profile data. Not something you would prefer if you are committed to providing value to your customers. Financial honesty and transparency is a basic expectation of shareholders, customers and employees. It serves no one when organizations “cook the books” – whether it be intentional or accidental. Careless accounting practices limit an organization’s ability to operate with good financial management. How can an organization’s budget be accurate when there is not complete transparency in spending? When an organization markets a product or service, they are obligated to deliver what was promised to the customer. Whether it is a television ad or a print ad in the newspaper, the product described should be what is delivered to the customer. For instance, we responded to a furniture ad one time and when we went to the department store we discovered they were out of that particular item and the sales person tried to sell us a similar item that was more expensive. Needless to say we walked out of that store. Unfortunately the sting of the “bait-and-switch” experience kept us from visiting that department store again. Not a good way to grow a customer base. You owe it to your customers to deliver what is promised. Management practices are the underlying foundation for organizational integrity. Whether it is commitment to good customer service or fair employment practices, a businesses’ reputation can be tarnished by unresolved service or product issues. Additionally, employees observe how leadership resolves issues and follows up on promises made. For example, SAS ranked number 1 out of the top 100 employers to work for in 2010. In addition to a very generous benefit package, and an industry low turnover of merely 2%, the architect of its culture is based on “trust between our employees and the company” according to Jim Goodnight, SAS CEO. Influence integrity in managing by creating a code of conduct and ethics policy. Teach employees the importance of its content and the organization’s commitment to ensuring that all employees adhere to the policy. Service after the sale is what service integrity is all about. It is easy to make promises before a sale but following up and ensuring a great customer experience is what makes some organizations stand out. For example, we built a house a few years ago. The customer experience was over the top – until we closed on the house. Unfortunately it went from one of the best service experiences I’d ever had to one of the worst – after we closed the deal. Service after the sale is critical to providing a great customer experience and growing a loyal customer base. It is important for business leaders to live a lifestyle of honesty, integrity and high ethical standards because what these leaders do can harm the reputation of the organization. Two former Tyco executives, who have become the poster children for failed ethical leadership, are a good example of this. Both were sentenced up to 25 years in prison after stealing hundreds of millions of dollars from the company. The scandal sadly generated negative press for Tyco and ultimately affected the company’s value and profitability. Product integrity is important to those of us who purchase products and services. This is when public perception and brand recognition come in to play. When we chose our home-builder it was because they were one of the largest in our area. Unfortunately, our experience with their service after the sale spoke volumes to us about the the product integrity of this builder. If we would have known the service integrity would have changed so drastically after the sale we would have been a little more diligent at ensuring the language in the contract supported resolution of issues once we closed on the house. Organizations that operate with integrity do so intentionally and make it part of its everyday practices so that it becomes part of the culture. This climate of honest and trust helps orient new employees to understand that operating with integrity is simply “the way things are done around here”. Organizations choose to make integrity an important part of cultural expectations. This focus sends a message to employees and customers that the priority is sustainable success over short-term opportunism. In what ways does your organization demonstrate integrity and ethics? With reference to the above topic – attention is invited to a reference material – a free download publication of the ICAI (www.icai.org) titled `Study on Investigative Audits’. The contents would be of relevance to business ethics in Indian conditions.